Stefan, the love of my life and my travel companion, is the darling of all women on the campsite called Jungle Junction, in Nairobi, Kenya. This man knows how to clean! He has arrived one week ahead of me, for what will become our biggest adventure yet, the blackcontinent tour, through Central and Western Africa. He uses the extra time, to take care of our Land Rover Defender 110 – Landy in short - that has been patiently waiting for us in Kenya through one of the toughest rainy seasons. Cleaning up the mess is no easy task. With 40.000 km ahead of us, some technical fixes are also necessary. We are after all talking about a 4x4 that is 12 years of age and spent most of his time on African roads. To top it off, the princess and the pea has requested a comfortable space for her beauty sleep. So Stefan – together with our German friend Rainald Schumacher, who owns a Land Rover garage in Nairobi – installs a roof tent of gigantic dimensions which Rainald calls „your little pleasure dome“. 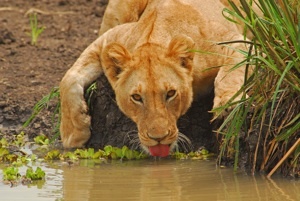 Looking back, we have travelled Kenya more intensely than any other country on the African continent. Our Land Rover was left behind in Nairobi, after we had taken our first trip through the south and east of Africa in 2003. Ever since then, we came back once a year for our annual leave, seven years in a row. Many memories – good and bad – are attached to this country. Now, that we are leaving for what looks like the last time, nostalgia takes over. Nowhere else did we get to know as many lovely people as here. We will miss them dearly, that´s for sure. What we have experienced in fast motion, on our four week trips through the country, is how Kenya rose like a phoenix. Kenya today has a middle-class that can afford luxury goods and vacation on the beach. Typical advertisements in the year 2003 would depict flour, cooking oil or measures for the prevention of AIDS. Today ads are about tires, mobile phones, fancy kitchen furniture or flights to Dubai. The roads have improved tremendously. In earlier days, the journey from Nairobi to Mombasa was a tiresome hop on crumbs of tar, interspersed with potholes. Nowadays crossing the country from Eldoret at the border with Uganda, via Nairobi in the centre, on to the coast, is easy on perfectly tarred roads – a project sponsored and conducted by the Chinese, who have economic relationships with many African countries, mainly for one reason: resources. You could argue that I am putting lipstick on a pig, since Kenya still has a long way to go, regardless of growth rates of more than 10%. Corruption was and still is a huge problem. In many provinces the question of legal possession of estate is still open for discussion. This leads to constant rows between tribes. Many people even today live below the poverty line, regardless of how you define it. But Kenya has a once in a lifetime chance. A new constitution has just passed, which attempts to right a lot of the wrongs. For once it seems that the people are living their countries motto „harambee – let us all pull together“. We have lost our heart to Kenya and hope for the best, for all of the wonderful souls living here. Life in Nairobi has its advantages: parties at in-clubs, swimming in Schumacher’s pool and dining in the finest restaurants in town, but this is not why we came here and after two weeks of luxury life Stefan throws a tantrum and needs to get out. 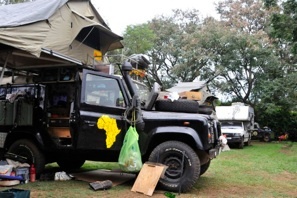 We start our long journey along the coastline of Africa, heading south towards the border with Tanzania, a black Land Rover and a white Land Rover, the latter belonging to Steffen and Steffi from Saxony. 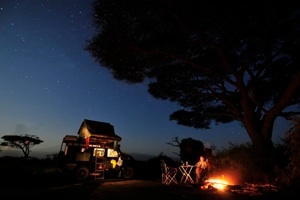 We settle in for our first night in wilderness, just outside the Amboseli National Park. 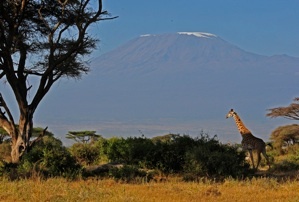 Unbelievably, on our first evening the Kilimanjaro lifts its veil and we enjoy the full view onto its glacier capped top. Steffi has prepared a delicious meal, but it simply cannot compete with the sunset, that bathes the landscape of umbrella acacia in red and orange light. We eat the cold dish later on in darkness. 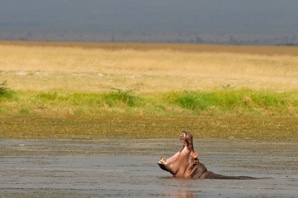 Spotting animals on a safari through the Amboseli National park is easy. What we see today however is rare: A group of elephants is performing a race right in front of our eyes. Just a few miles further 30 hippos are lying on the shore in mid day, their shimmering skins coquetting with the lens of Stefan´s camera. The parade of animals continues, zebra, impala, giraffe and wildebeest. All along I keep one eye on the Kilimanjaro (Kili), but the famous landlady (I consider the mountain to be female) is hiding behind the usual veil of clouds. Suddenly, towards the end of the day, she drops her white dress. 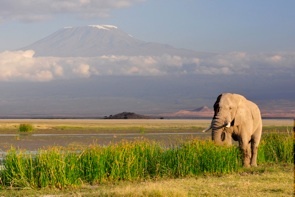 As we watch in awe, one of Stefan´s ideals comes true, „a group of elephants in front of Kili at sunset“. Arriving at the camp inside the park we immediately feel the „out of Africa"-feeling. The vastness of the African steppe to the left, Kilimanjaro straight ahead and...Ok pit latrine to the right, but nothing in life is absolutely perfect. Stefan is still busy taking photos of the setting, while I am impatiently awaiting the pop of the corks of our bear bottles. Tonight, we enjoy a star spangled heaven. Circling Uhuru - as the Masai call the Kilimanjaro - on its eastern slope, we come close to a crater lake called Lake Chala. I say close, because we have been unsuccessfully looking for a way up the steep volcanic mountain for more than half an hour by now. Our GPS is of no use to us here, with any roads. We are looking for a lodge which is supposed to be sitting on the crater rim. I start walking cross-country. The cars follow me slowly until we find the „forbidden path“ up. The two Land Rovers start ascending a narrow dirt track scattered with big grey rocks. The vehicles make noises like steam trains and shake right and left with every hurdle they take. We reach the top and all of a sudden have a breathtaking view of a deep blue lake that fills the volcanic crater beneath us. The cars keep surfing the rim and we eventually come to a barrier made of shrubs. 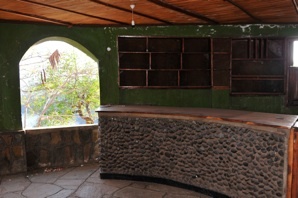 We remove it without remorse and finally reach the lodge or rather the Lake Chala Safari Lodge Ruins. First we consider the place deserted until we feel eyes fixed on our backs. Three men are hiding behind the shutters of the main building. We decide to ignore them for now and explore the place. It is like somebody had brought time to a stop. The gardens are still neat and filled with Mediterranean flowers. The bar made from teakwood stands there intact even though emptied of all its bottles, as our men morosely observe. The patio is framed by semicircular arches that allow the full view of the colorful waters down below. This lodge must have once been a noble, stately place. You have to watch closely to see the bats dangling from the ceiling. We decide to set up camp and cook a luxurious dinner. The locals dare to come out of their hiding and start talking about how the lodge was abandoned by its owner in the year 2000 after business became scarce. They had been employed here and it seems they are still being paid for watching over the ruins of mahogany, through which at night a firm wind blows that causes a ghastly sound. We dine on white tablecloth (which is a bed sheet really) while we watch the sun set smoothly right behind the lake. The locals share their firewood with us and we talk until night falls onto this mystic place. Our gesture of thanks (a small amount of money and cigarettes) is gladly accepted by the trio, before we head back down the next morning, this time taking the official track. We say good-bye to Steffen and Steffi and continue to the border with Tanzania, our next destination. 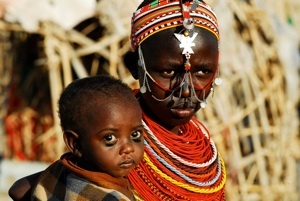 A young woman from the El Molo tribe with her child. The area around Lake Turkana to the far north of Kenya is rich in cultural diversity. Different tribes live there, not always in perfect harmony. 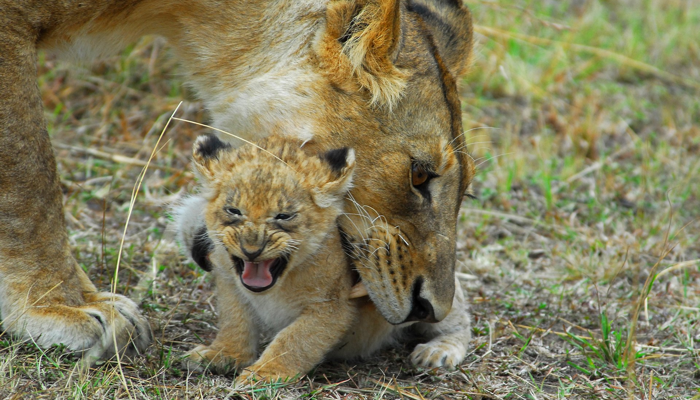 The Masai-Mara is our favorite National park in Kenya. Nowhere else can you get this close to wild animals. Baby elephant on the run at Amboseli NP. This hiippo is not amused. 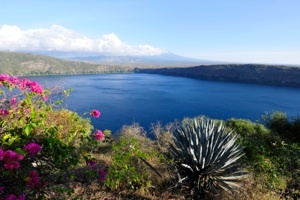 Lake Chala in southern Kenya. African living-room. Our home for the next 12 months. Cleaning and fixing before the big trip. No female involved.